I love interactive books. They are really great for minimally verbal students. They can show their knowledge without needing to verbally produce answers. For kids just learning to express themselves in single words or simple phrases, pictures support that level of speech. If students are communicating in sentences they can make up their own language to describe the picture/scene. I made these books available in two sets. The first set is a Back to School Set. It includes the ‘School Tools’, ‘Actions at School’ and ‘Places at School’ books. You can find it here on TpT. I’ve used these so much during the week! The kids loved them and I got amazing baseline data. All the pictures on the base of the book get a piece of velcro right on top. Then cut out the same picture and put directly on top. As the kids read the book they find the corresponding picture to match the page and stick it to the page. I’m so glad I had them in my rolling cart this week! The Wheels on the Bus book includes the first two lines of each lyrics written with adapted symbols. The student matches the picture to the correct part of the bus. Lightened pictures are used for support. 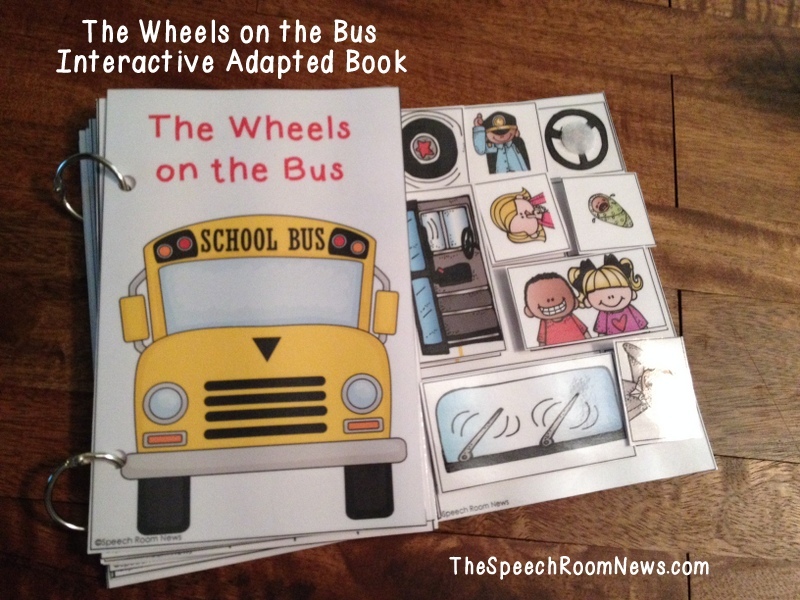 The Wheels on the Bus download is available separately from the other sets. You can find it in my TpT Store. Thanks for stopping by! Let me know how YOU would use these books and you can win yourself your choice of sets! This would be great for my kiddos! These books look great! I love how the page of adapted symbols are easily accessible as you move from page to page. These look great! I have a ton of your TPT items and love them all! This will be great for my PK/K students! I’d love these for my preschoolers, KGs and moderate students! I have several students who will benefit from this. It allows students to interact and have fun. These would be amazing for when I push in to center times the first few weeks in my preschool! We just did wheels on the bus and had a few kids who I would have liked to help participate more. Awesome products! This looks great! I have several students who would love it! I serve primarily SH classes, so anything with visuals is a plus. This would link easily to music. Very eager to use this resource to expand my students’ language comprehension and production! This would be great to use with my preschoolers. This would be great for my younger students with multiple disabilities. I’m always looking for something new and fun to try. These look great for Pre-K! I just started working with a preschool/kindergarten ASD classroom and the kids would love these. I’ll be searching for more interactive books in the future to use! This would be so useful for all of my younger elementary students. I have a lot of kids working on basic vocabulary and forming sentences right now! Can you tell me which version of the song does the indicative book follow? and what is the visual aid picture under the steering wheel? Well, it’s the generic one I think (Wheels go round, horn goes beep, people go up and down, babies go waahh, mommies say SHH, daddies say I Love you, door open shut, wipers swish, driver says move on back). That is a picture of a baby swaddled and crying. Hope that helps! That is the BEST idea to have a space to attach the Velcro pieces ! I have never thought of that before with my adapted books! You’re a genius!!! I would LOVE to have these book!! I have a lot of nonverbal students on my caseload and I am allays trying to come up with new ideas and activities to do with them, instead of the same old,same old. THESE WOULD BE AMAZING!!! I would love to use this with my new little preschoolers! 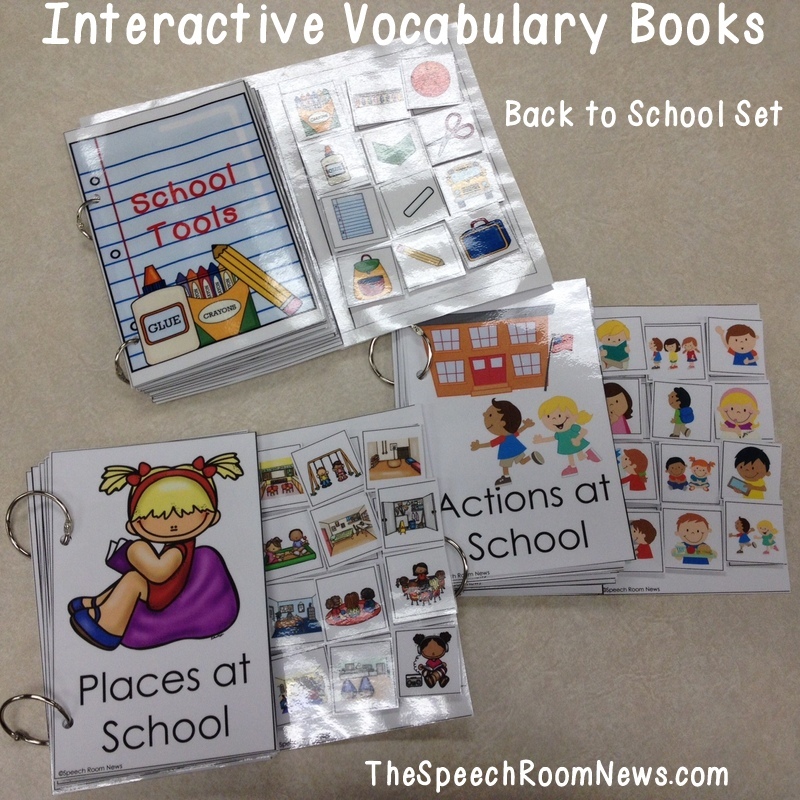 This is great for vocab development, following directions, answering questions and more! This will be great to work on functional vocabulary with my minimally verbal students! Oh.my.goodness! I love these! They would be perfect to use with my non-verbal Pre-K kids. I would love these for my EC kiddos to keep them motivated when using new vocabulary, for my 3 and 4 year olds who need to expand their language, and for my non-verbal kids that want to interact and answer questions to a story. I have the wheels on the bus CD that I play with loads of activities. This would be a great add-on to that unit! These are awesome! I have several students with limited verbal skills who these will be perfect! One of them is in 3rd grade and “Wheels on the Bus” is his favorite!! I would love to use these with my preschool kids. They would love it as well! Thanks for the inspiration. OMG! I love adapted books and this would fit in perfectly with my Early Childhood group. These books are amazing – not only do they look fabulous but really useful in helping our little kiddos. Would love to use them. They would be so practical. Thank you for sharing how you use this great resource! I’m already planning how I can use these with my students! They are perfect for my pre-k kiddos and some of my ASD kiddos too! These look amazing! Can always use interactive books to target language and sequencing with the younger kiddos. These would be great with my nonverbal/limited verbal preschool/kinder students! I work children who are on the spectrum and who have multi-disabilities. I have made these types of books and found them to help children with severe disabilities follow along and participate when reading. My two first graders with Down Syndrome need these! The students in the pre-k autism classroom at my school love these types of activities and I’m always looking to add to my collection! I can’t wait to use these. I am dying to get my hands on these! 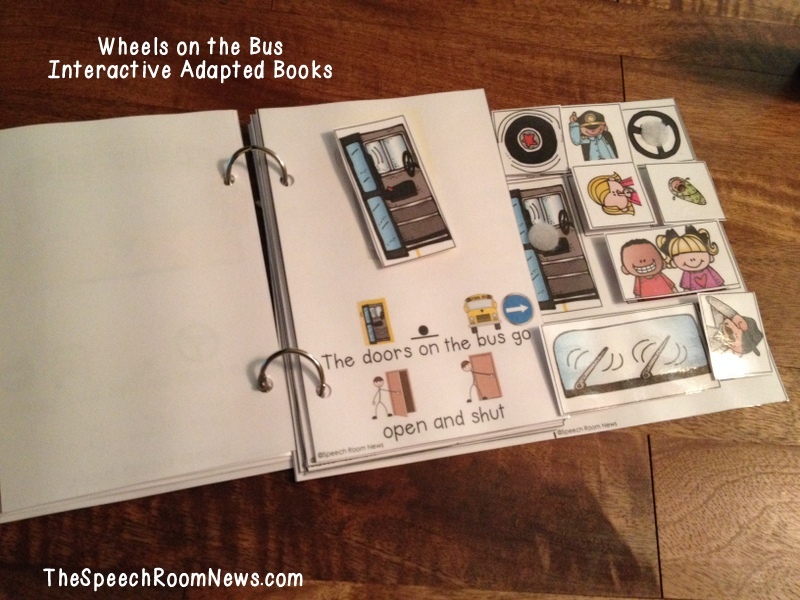 I have been looking for quality adaptive books for a while now with my little ones. I have found that adaptive books are the most successful materials that I have and always find myself grabbing them when I am in a pinch because I know that I can get a lot of data and [more importantly] good therapy time in with my kiddos. Can’t wait to try these out! Thanks for another wonderful product, Jenna! You have seriously done it again! I picked up preschoolers this year so my materials stash is low for these kiddos. I would LOVE to have this pack in my bag of tools! This would be so great for all the nonverbal and beginning to talk kiddos on my caseload. I have so many that love to read and practice reading books even though they are to young to actually read the words. Plus it’s so school oriented I love it. If I don’t win I will be buying for sure! I’m always struggling with teaching vocabulary and finding resources to do so. This would be a prefect addition to my repertoire. I would use these with PK and K students that are at a range of cognitive abilities. I think they would also be very motivating to PK and K students who are tricky to engage in therapy. I have students that this is perfect for! Would love to use this with my preschoolers, even with some of my Kindergarteners. Love the graphics! Would love to use this with my kiddos with cognitive disabilities. Adapted books are great for them! These look great! The books look like they would benefit PK’ers of many different abilities. I love how you have them organized as well! This would be a great activity for many of my young and/or minimally verbal clients! Very cute activity! This would be great for my kids with limited verbal abilities. This looks amazing. I have all EC and pre-k this year, so this would be great! I need these! I already use your book companions so much and use them in ways to help edit and reach my non-verbal AU classroom…these would be a great addition! Love interactive books! These are great! These are fabulous! I love the visuals and the content! These would be awesome and so motivating for my PreK, K, functioning kiddos, and just for review! Thanks so much for the giveaway opportunity! I love your products! These are incredible and would be great with my MDS and Autistic Support kids! These books would be great for my primary MH kiddos! I work with all special needs students. I know that my preschoolers would love these. I work with lots of preschoolers who would love these! Thank you for a chance for a great giveaway! These look AWESOME!! I love using books of any kind in therapy! I work in an autism program. I love adapted and carrier phrase books!! It allows all my kids to participate! They love making sentences with the pictures! This be wonderful for early childhood students as well as some of my students autism. Limited funds at my school make it difficult to buy quality materials. Motivation, participation, inclusion in multiple settings for students in programs for students with developmental disabilities, multiple disabilities, moderate intellectual disabilities, and autism. You have created a functional tool that addresses so many needs. Impressive! It’s my CF year and I have just started seeing kids. I don’t have very many materials yet and most of my kids are very young with little or no verbalizations. These are perfect for them. I live in a rural community, I would use these with my kiddos in the clinic who are just beginning school and for those preparing for school.They are great materials. I work with the preschool disabled population. These adaptive books would be great for them! It’s good to use in a small group to target different levels also! These books look like fun! These interactive books look great! I’ve made many books before and it can be so time consuming. Being able to download and print these books saved so much time. I love that I can get such high quality work so quickly! 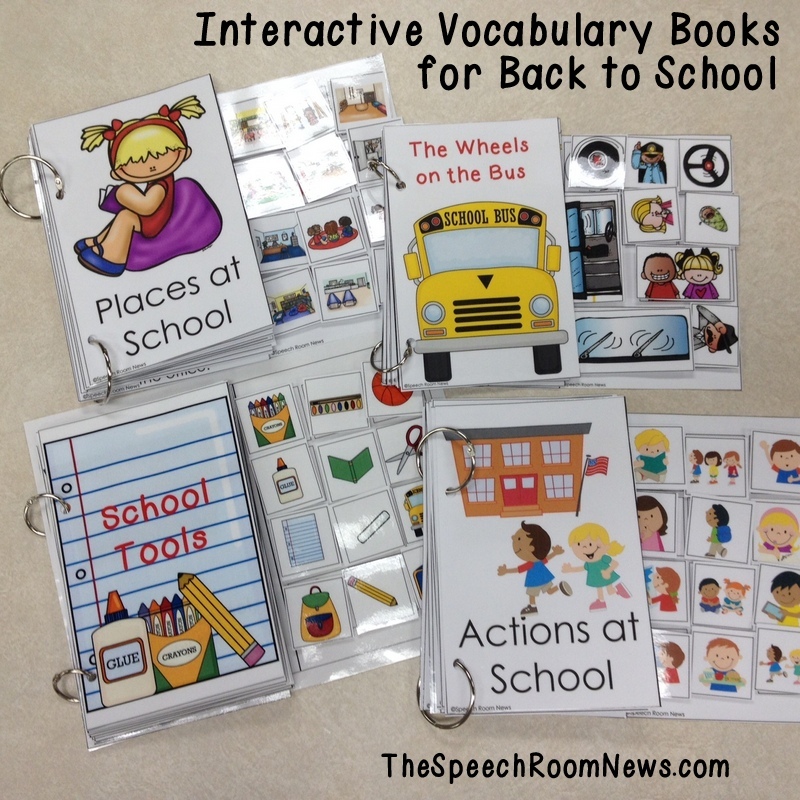 These interactive books would be GREAT for several non-verbal students on my caseload! Im just starting back to work after a year of maternity leave and would love these. The wheels on the bus is an all time favourite and the visuals would help so much. Thanks for all of the great work you do. These are so cute and great for our low-incidence populations! I’d love to use these with my minimally verbal students to increase verbal output. You never cease to amaze me Jenna! These look amazing! I just received some minimally verbally kids on my caseload. These would be great for them! These would be perfect for my students with Autism. I love having something that’s visual (for me and the student) to help collect data. I’m a prek Beginning SLP and the would be perfect for my little guys!!! I would love to win these because I have a new kindergarten student who is completely non-verbal and spending the majority of his day in the general ed classroom. The “Back to School” set would be especially helpful for helping him to understand and request school routines, supplies, recess activities, etc. This would be perfect for going over school vocabulary & actions. I like how there’s a lot of manipulatives and pages included in each book. love these! They are great for all my special education students and great extra speech practice/support in the classroom. Great resource! I’d use it in my language groups. These are great! Would love a copy! Would be perfect for back to school! This would be perfect for back to school! I hsve several low level autistic kiddos that this would be great for! Hey Jenna – I just started working in a low-SES district that is really short on materials. Having a set of these would really help out working with the incoming kindergarteners and preschoolers (among other kiddos) to discharge out of “speech only” IEPs. This would be a great activity for some of my lower-functioning and minimally verbal students. I love that the vocabulary is very functional. This looks great for little hands! I am so excited to make these. I think these are perfect for all my preschoolers coming back to school. What a great idea! I have a lot of PK kiddos as well as LifeSkills that would greatly benefit from a hands-on activity like this! I love using your products, they are fantastic! I am excited to be working with all preschoolers this year! This would be an excellent tool to use with the little ones! Thanks for all you hard work! My preschoolers love interactive books so I know they would enjoy these new additions. I love how interactive it is! You put a lot of work into this and it would save me so much time and benefit my students! Some of my ASD students will love the bus theme! Love it! Perfect for a ton of my earl childhood kiddos! Would love to help my little guy with these. He especially enjoys books with Velcro that involve some thought. Great idea! 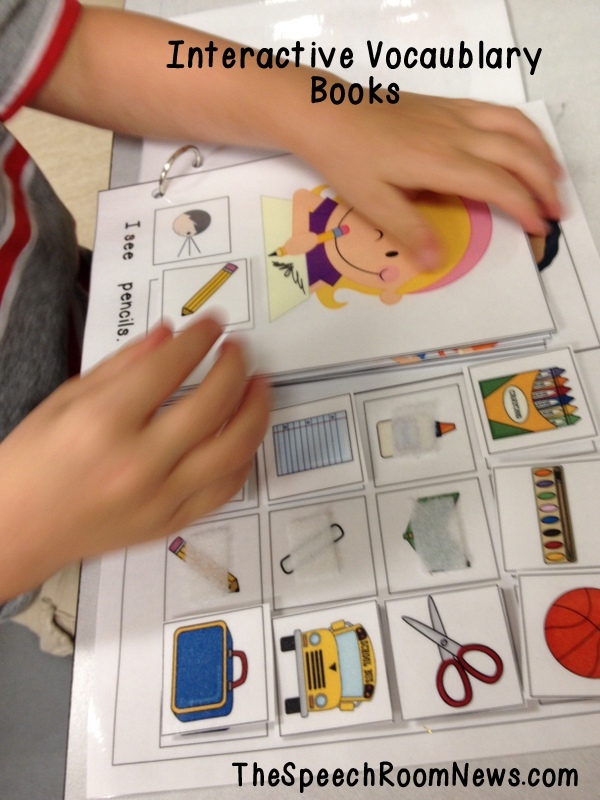 I use a lot of interactive books with my ASD students! These are perfect for my preschoolers! Great for building basic and functional vocabulary! Love the organization for these books – have done similar type activities for sentences but love the small books. Thanks for your hard work! This coming week is my school theme! I don’t know when you have time to sleep since you’re always making these adorable materials! I’m newly assigned to the severe preschool classroom and need to revamp my materials. This would be extremely helpful to have! These would be so great for my preschool caseload! I could see using it with my nonverbal kids, autistic kids, apraxic kids, language disorder kids, the possibilities are endless!!! I provide speech and language therapy to students in two special education classrooms, and these would be great. The kids need to be actively moving their hands, and this would satisfy that movement while exposing them to excellent content. Where do you find the time to make these great materials ?! Omg, my pre-k kids would love your books! Thanks for sharing!!!!!!!!!!! The interactive books are great! I teach SDC preschool and currently have a class with 2 3-year olds that read anything and everything as well as 2 nonverbal (and 4 kiddos in between) and these books would be a spectacular way to have all my kiddos involved ;-). I’m always looking for new activities to keep things fresh and interesting! I will be spending some more time on your site! Thanks for sharing! These would be so helpful with my students in our life skills classroom! I’m always looking for ideas for my non-verbal kids. Wonderful! I haven’t used any interactive books before, but I have two new K students who are minimally verbal, so these would be GREAT! Many of my students could benefit from this awesome material! This would be a great material to add to my collection as I enter my CF soon! I am starting to work with pre school aged kids once again and love this interactive book! It can be used on so many levels and adapted to specific needs! These would be awesome for my PK students!! I love interactive books. 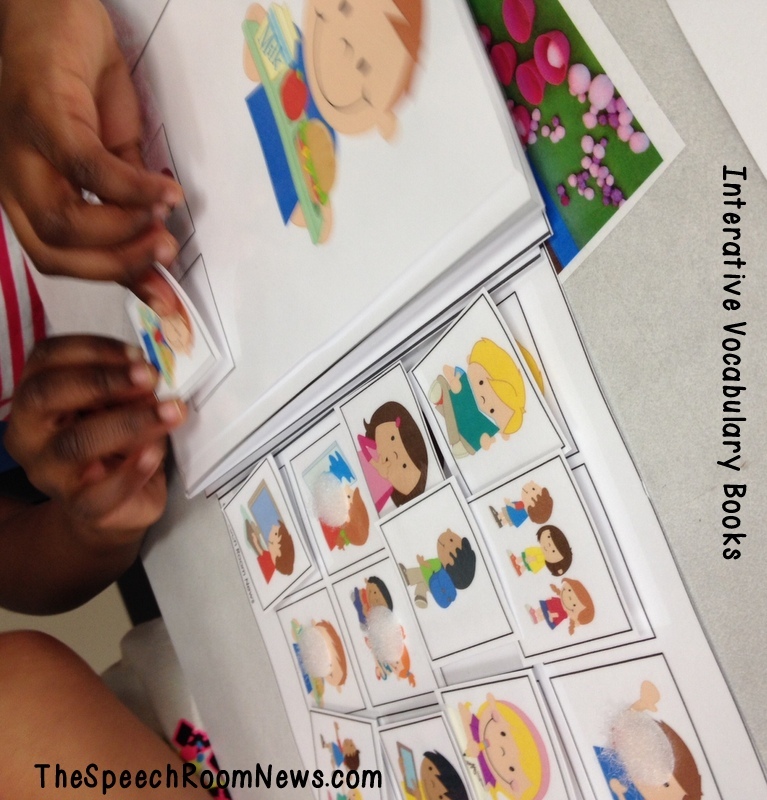 For non verbal or minimally verbal students they need someway to participate, interact and learn. When you use books with manipulative students have a chance to show you what they understand. You make the BEST materials! I work with half of a class of preschoolers – many with significantly delayed speech and language skills – and these books would be a fabulous fit in their lessons. This would be great for my little ones! My students would love doing these!!! I love these books! So useful and engaging. These would address so many different IEP goals for my kiddos! You have some great, concise pictures in some of the books/games…what do you use to get those wonderful pics? I often just use google images but they are on a colored background or it’s not just the item I’m looking for. Love your interactive books! I buy clipart that I can use for commercial products. Because I sell them I have to buy clipart that allows that! Here is where I got the clipart of the places at school : http://www.teacherspayteachers.com/Store/Educasong. I love these. All my kids liked them including my AI preschoolers that are sometimes very hard to engage. Have you thought of doing one monthly with seasonal or holiday themes (Halloween, Thanksgiving, fall, Christmas, winter, spring). I would surely buy those. I can make them but they won’t be as cute as yours. So worth the money. These are way too good for words. Thanks as always for your creativity and hard work.